YEAH!!!!!! a REAL shorts/pants pattern!!!!!! 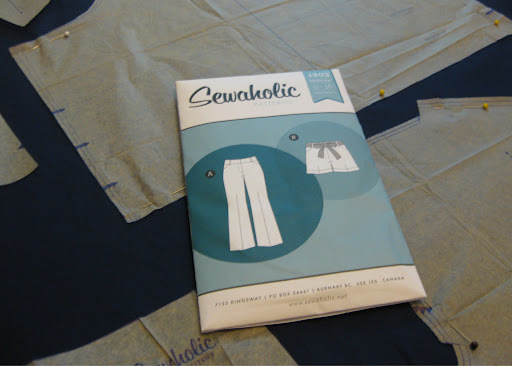 so in case you haven’t jumped on the sewaholic bandwagon (and really i was feeling as though i was the lone holdout…) the thurlow is the one to splurge on. 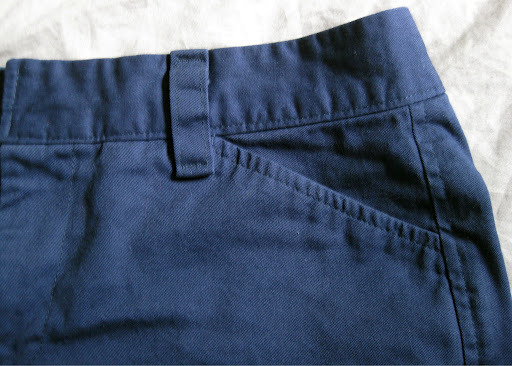 after making up my blue shorts a couple months back, i was pretty meh about the complete lack of pant patterns that have all the bells and whistles of a normal pair of pants: fly facings, fly extensions, welt pockets, etc. 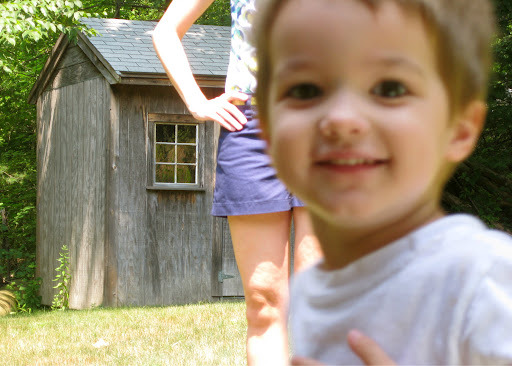 and literally as i was composing my blog post for those shorts, my email chimed announcing the thurlow. seriously. it was as if the sky opened and angels sang. at least the voices in my head did. even though i was mere tweaks away from fitting my bottom half with the mccalls 5391 short pattern, it was really a sense of screw you mccalls… a little gal in canada did it BETTER! that made me abandon the mccalls and immediately purchase the thurlow. when it comes to patterns, i’m more of a wait-for-the-$1.99-sales-at-joanns person than a splurge-over-$20-on-a-pattern person (my colette patterns, while i love them, have all been gifts). but i figured, this is a staple that i will use for years to come. 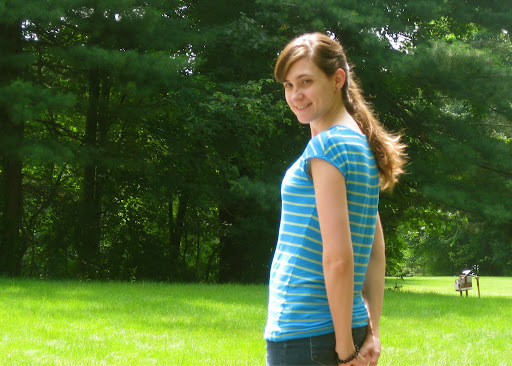 unlike a dress pattern, which may or may not ever see multiple versions (though i’m completely in love with the cambie and totally want it now!) this pattern will be repeated. in fact, i would spend more than $20 for a pattern like this. too hot to bother retaking in a better spot. just so you know, you may cut out (or trace) all your pattern pieces and be completely dissuaded by the sheer number of pieces. but, each has it’s place and purpose so soldier on my friend! it will be worth the effort. so, what are all these details i’m talking about? you know those little strips on the inside of your rtw pockets? the pocket facings? included. welts (along with fantastic directions)? included. separate fly facing piece? included. fly extension? included. and yes, these things ARE a big deal. why? mostly, longevity. while i love my blue shorts, i can tell that not having all these details, and just having the straight turn and burn waistband will decrease their life. when i finally had a chance to start sewing up my thurlow shorts i even skipped the muslin. e gads! i didn’t have time, plus i was able to pull out my mccalls pattern pieces for a little comparison. so i wasn’t going completely blind here. my measurements were a perfect 6 but decided to cut a size 4 based on pattern ease and comparing to my other shorts. turns out, the 4 fits me perfectly. not a single alteration was needed. 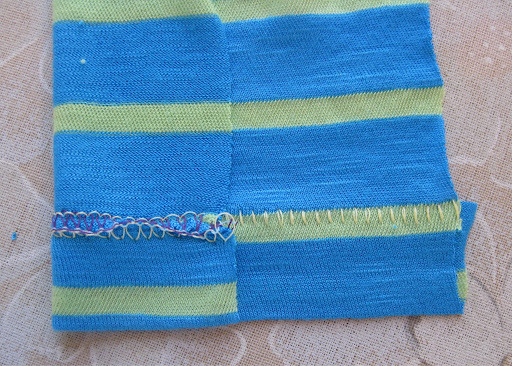 even that back seam with room for adjustment, i sewed on the original stitch line. sheer unabashed joy!!! 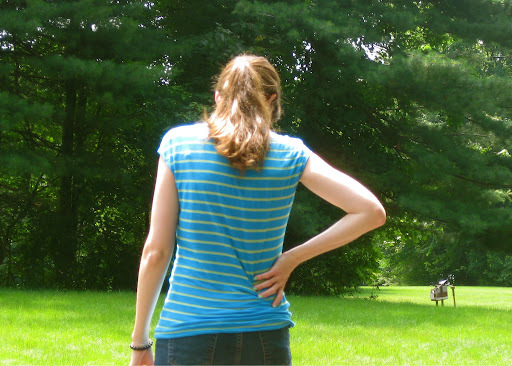 yes, i realize my elbow is sticking out in a very awkward way. i made only minor changes to the pattern, mostly just cosmetic. since i wasn’t making “dressy” shorts, i made them out of a nice weight twill and opted to topstitch things like the pocket opening edges, side seams, the crotch seam, parts of the waistband, around the welts, even down the back darts. 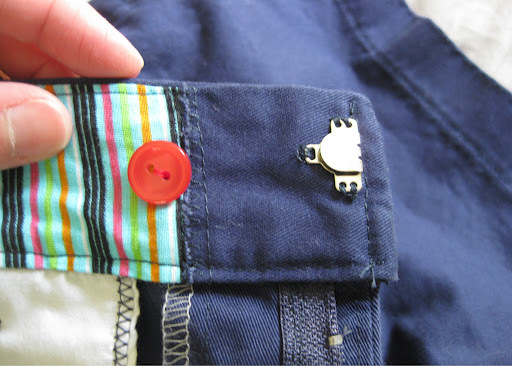 this gives the shorts a little more reinforcement for every day wash and wear. also, i opted to french seam the pocket bags of all the pockets. i see this in even the cheapest of rtw shorts/pants i have so i figured why not. since it only takes a few extra moments to do this, it is worth the effort. and, lucky you, i photographed my process so you can do it to. this should be my next post, if you’re interested. last thing i added was a little patch of the twill on the inside of the waistband where the hook is. i made it to line up with the fly facing, not thinking i should have made it long enough so that the inside button could be sewn to it also. i just stitched this piece on, then zig-zagged over the edge so it sits flush without added bulk. lastly, i went to hem them intending to have the cuffed look and for the life of me i couldn’t figure out how to do that. seems i can breeze through double welts and fly construction only to be confounded by a cuff. so i cut off a few inches and hemmed them as normal (and later it dawned on me that the instructions were not cryptic, and i figured out what i should have done. doh!) oh, and i couldn’t be bothered to add all six belt loops (i hate doing belt loops) and settled for five. oh… and i reversed the fly to zip from the right, not from the left. just a preference of mine (and every pair of pants/shorts i own…). it’s easy to do: whenever a pattern piece says to cut from the right side of the fabric, just cut from the wrong side and it will all be reversed. i love this pattern!!! the fit is incredible, and i can’t wait to make more shorts and pants with it. i had no trouble following the directions (except for the cuffs… my bad.) so if you’re new to pants, you should still be able to work these out. at least, don’t let the number of pattern pieces scare you off! i actually made this uh… in april? seems i’m a bit behind in the posting since (despite wedding sewing) i’ve actually been churning out one to two finished projects a week for quite a while. and, much of what i have sewn has been knitwear. i’ve needed quick projects that don’t require much by way of fitting and that are well, practical. 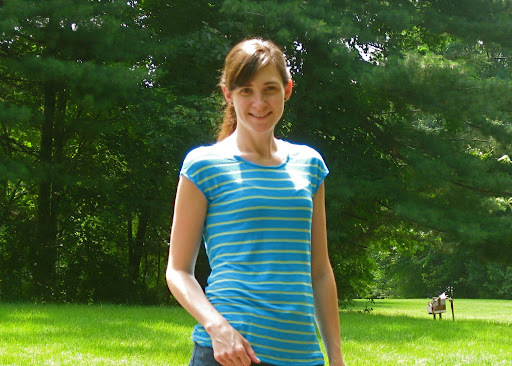 there is nothing like warm weather to dial up the need for casual tops and dresses! this is the first t-shirt i’ve made and it was not without it’s challenges. 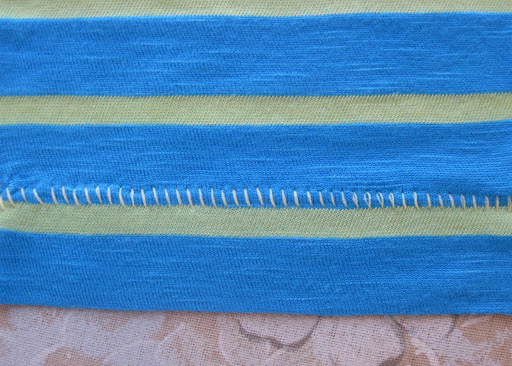 as much as i prefer a woven stripe (as opposed to a printed one) when i washed this material, the whole thing twisted sideways. had i sewn before washing, the twist would have been a good six to eight inches! so cutting was something of a challenge as this is a very lightweight rayon (?) blend. near tissue weight. if you LOOK at it, it moves. sewing it up however, proved to be much less difficult than the actual cutting. i did neck and arm bindings similar to the renfrew, only much narrower. 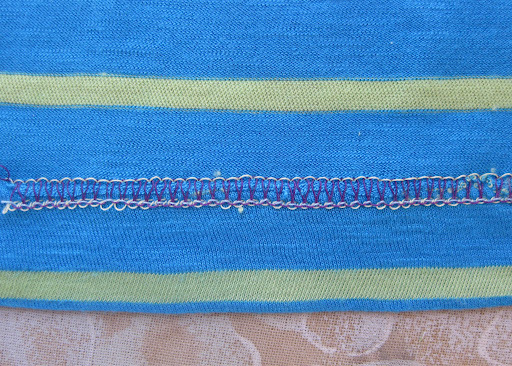 i topstitched with a narrow zig zag to keep the bindings from going wonky. then, i hemmed the damn thing. this stretchy, lightweight, tissue-thin material did NOT want to be hemmed. i know there’s a whole lot-o-people out there who are all like “AND IT’S KNIT SO IT WON’T RAVEL SO I DON’T HAVE TO HEM IT! YAY!” i am just not one of them. i don’t judge the non-hemmers (much…) but to me, it isn’t finished until it’s hemmed. it seemed my only recourse was to figure out how to do a top stitch on the serger. the instruction manual claims that this is possible, though my previous attempts to do so seemed to prove otherwise. actually, it was probably both. determined to figure this out, i spent 4 hours with a pile of scrap material until finally… finally! i achieved something that was passable. so if you’ve never tried this, it is worth fiddling with for the off chance it is needed for a hem or some interesting decorative stitching. for each thread as i figured out the proper tension. wrong side—see how the raw edge is enclosed? happy me! basically what you do is throw off the balance of the threads and fold your fabric similar to how you would for a blind hem stitch. the tension for the left needle is loosened, and tension for the loopers is tightened. 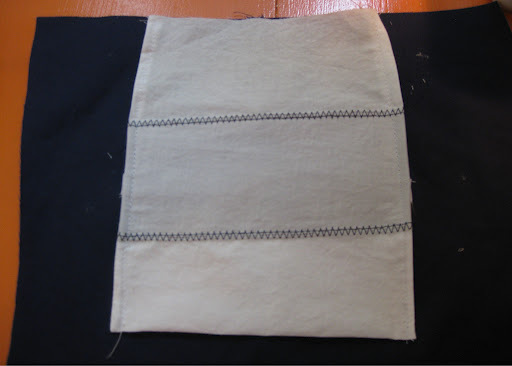 then once you have sewn, you open up the fold and end up with vertical stitches on the right side, and what looks similar to a coverstitch on the wrong side. for the actual hem on my tee, i used thread that matches and it blends right in. but, you could definitely use a contrasting color for fun! so take that impossible to hem fabric! you won’t see me with a raw edge.